How do I get the residuals for a glm with a binary response variable using R? I am running a glm with a binary response variable (0 or 1) in R, one of my significant predictors is continuous and the other is categorical. How would I get the residuals for this model, especially with the response variable being binary? 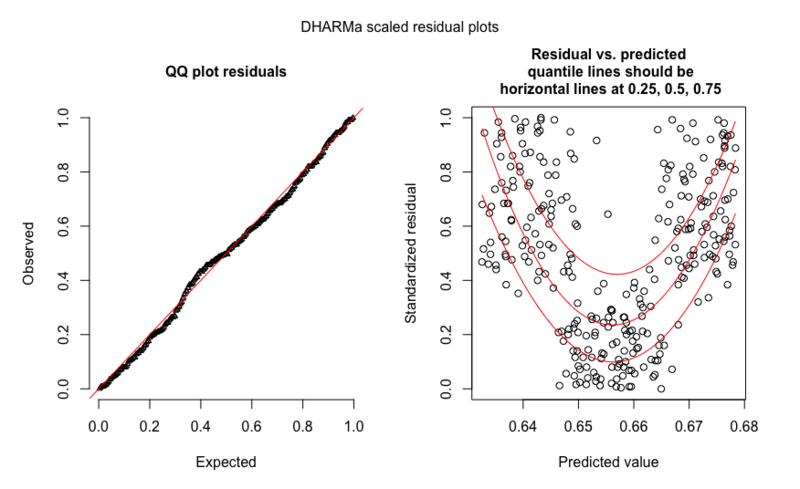 You can use the DHARMa package, which implements the idea of randomized quantile residuals by Dunn and Smyth (1996). Here an example with a missing quadratic effect in the glm, which shows up in the right plot. Not the answer you're looking for? Browse other questions tagged generalized-linear-model residuals binary-data or ask your own question. I need both quadratic and linear coefficients in a GLM with binary response. What's the best option? How to find the appropriate family for glm models? R: Plotting GLM residuals vs. linear predictor or response variable? Family of GLM represents the distribution of the response variable or residuals?